All samurai consider trade and the associated money-grubbing to be vulgar. It is, quite rightly, beneath them, even though merchants often end up rather wealthy! Trade ships are seen as a necessary evil, importing valuable weapons from overseas such as cannon and firelocks. Trade ships are unarmed vessels and should run away at the first sign of trouble: this wise tactic is their only defence! They are constantly threatened by enemy clans blockading supply lines, and by the wako pirates who infest the seas around Japan! 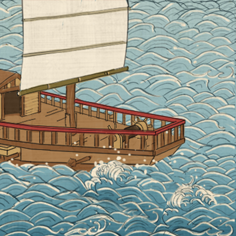 Historically, trade between Korea and Japan was usually hampered by piracy. The Japanese wako pirates would routinely raid Korean and Chinese coasts, while the Japanese authorities seemed powerless to stop them. China responded by declaring war on the pirates, ambushing them and burning their ships. The Chinese also attacked known pirate bases and beheaded those they captured. When Toyotomi Hideyoshi came into power he banned the owning of arms by all the peasantry, which greatly reduced the power of the wako. However, the same pirates who had just been suppressed were then recruited for their naval expertise: Hideyoshi needed them for his ill-fated invasion of Korea in 1592. Very small crew so very vulnerable if boarded.